For a consistent performance and profitable growth of any company, strategic and tactical information play a crucial role. Both of these are very distinct yet inseparable. External input: Macroeconomic environment, what competitors are doing, change in government policies, etc. Internal input: Company vision and mission, top management input, audits and feedback, learning from the past, future challenges, etc. Collating all this input helps an organization plans its strategy. These strategies have no meaning at all if they are not properly supported by means to achieve them. This is actually tactical information which is nothing more than the enablers to actually implement the strategies. An organization needs to do a necessary and sufficiency check for this tactical information. The necessary and sufficiency check actually helps an organization to establish that the tactical information is actually necessary and sufficient for implementation of a strategy. The basic difference between strategic and tactical information can be explained with a simple example of a steel making company. The steel making company produces different grades of steel at the lowest cost and is a benchmark in the industry. The company wants to sustain the identity of being the lowest cost producer of steel for the long term. So this particular objective of the company should be termed as strategic information as it qualifies as a long-term goal of the company. Now the company analyzes that it can achieve its target of being the lowest cost producer only if it is able to secure a long-term supply of cheaper raw materials. The long-term supply of cheaper raw materials can, in turn, only be ensured if the company has its’ own source of raw materials and it is not dependent on other suppliers. The raw material for the steel company is iron ore, coal, and limestone. All these are natural resources available in the Earth’s crust. Therefore, the company decides to acquire new mines so that raw material security can be ensured in the future. This, in turn, supports its strategy of lowest cost producer of steel. Therefore it can be termed as tactical information. 1.Strategy refers to the “what” and “why” a company plans to do in the future, and tactical refers to “how” it plans to implement it. 2.Strategy formulation involves consideration of all type of external and internal input while tactics is actually the actions to implement the strategy. 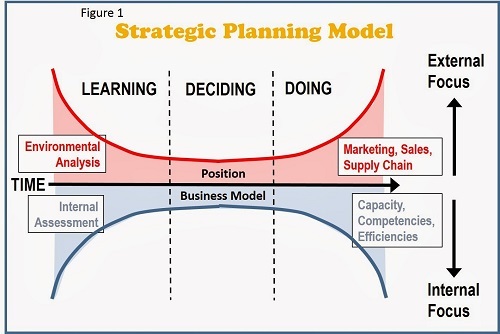 3.Strategic information is needed for long-term planning and directions. Tactical information is required to achieve short-term goals to achieve performance and profitability. 4.Strategic information involves a period generally up to five years while tactical information involves a period of up to a year. Nimisha Kaushik. "Difference Between Tactical and Strategic Information." DifferenceBetween.net. March 13, 2018 < http://www.differencebetween.net/language/difference-between-tactical-and-strategic-information/ >.